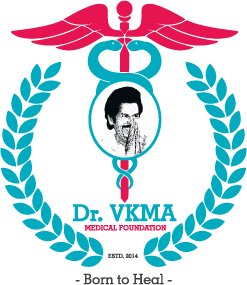 Dr. VKMA Medical Foundation (Dr. VKMAMF) was founded on 2nd November 2014 in a loving memory of The Late Dr. KM Ayyanathan, Ph.D., (Hons). The vision of the foundation is to provide medical care at its best in all specialities of modern medicine with the motto of ethics in patient care. Dr. Ayyanathan was born on 20.03.1943, in the village of Vadaseri located in Thanjavur district. At a very young age, he travelled to Madras for his schooling. For what would later seem to be a boon, he decided against further schooling after his secondary education, in the hopes to become an entrepreneur. He learned the art of business, gradually establishing his own in the city of Madras at a young age of twenty years. He came out victorious in the various ventures that he undertook; purely a result of his immense hard work, dedication, and merits. His vision to start educational institutions in his birth town was fruitful and earned him the prestigious name of “Kalvijothi”. Dr. Archana IVF and Women Centre & Dr. Shivan Cardiac Centre— governed by Dr. VKMAMF— were established in March 2018 to commemorate the 75th birth anniversary of Dr. VKM Ayyanathan.